One day in November, the friends from the Bamboo Bathhouse were taking a stroll around Asakusa. Kiku pointed out that a graffiti rainbow that they had discussed before had been covered by a poster. 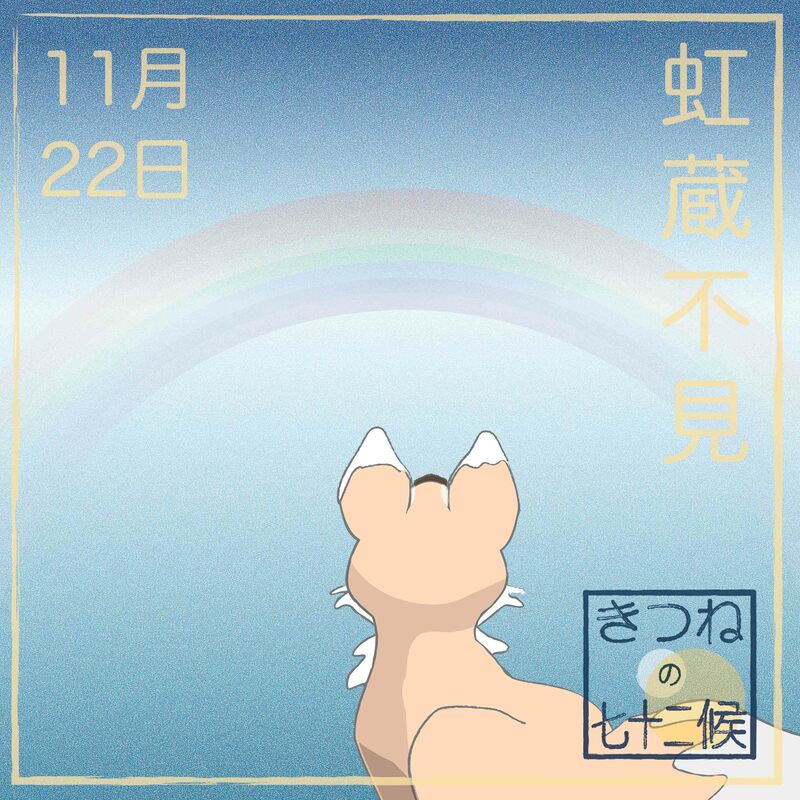 “That reminds me”, said Boss Panda, looking towards the obscured rainbow art, “today’s seasonal marker in the almanac is entitled is ‘rainbows hide”. 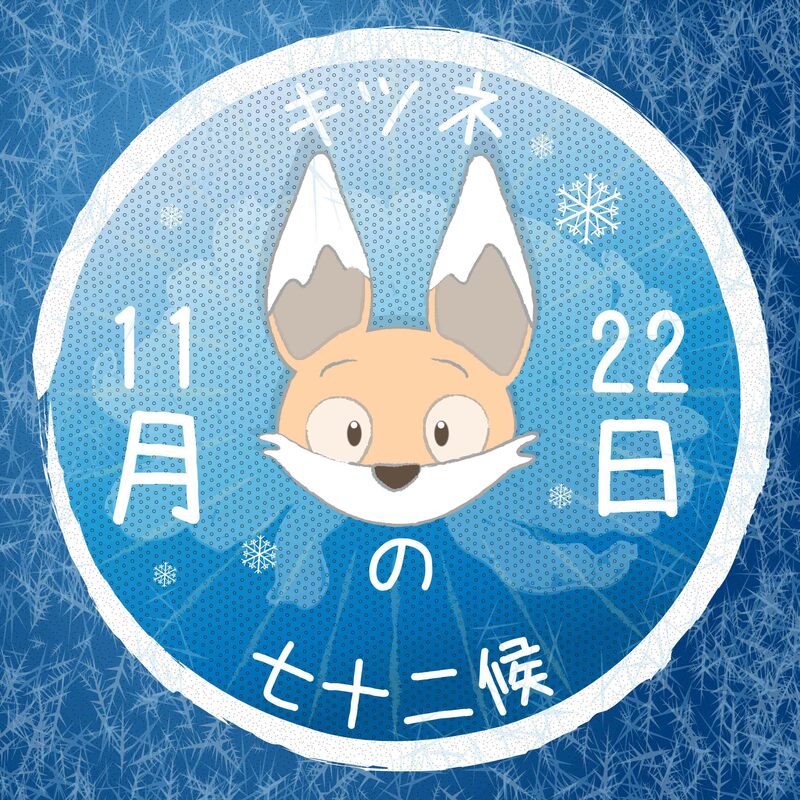 Kiku the little fox looked confused. “What does that mean?” he asked. Boss Panda explained that with the sun’s arc getting lower during the winter months, the daylight is weakened, and rainbows may not often be seen for a time. In addition, winters in Tokyo were also quite dry with little rain. 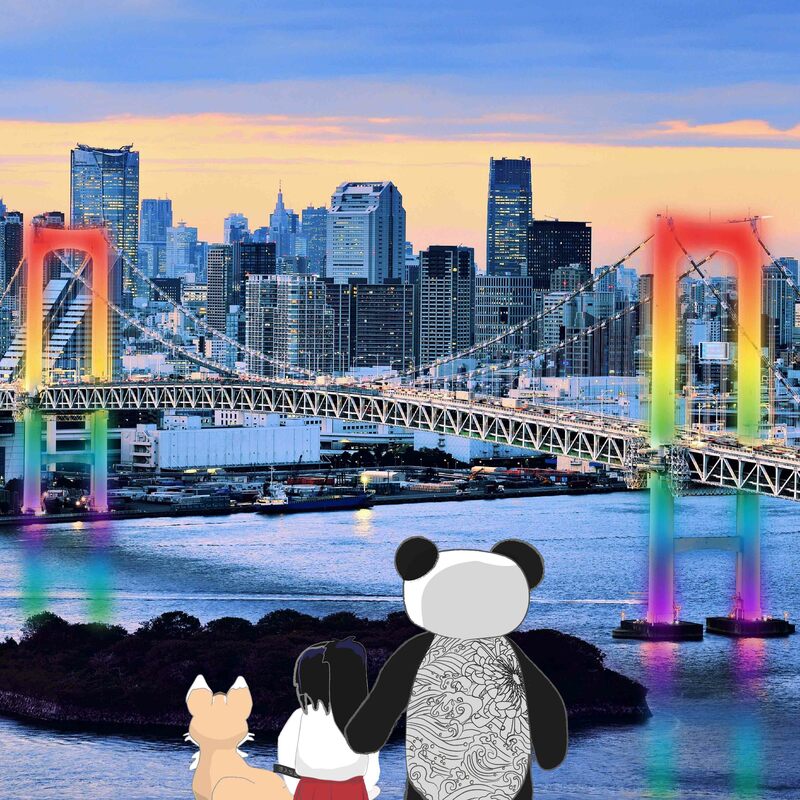 “However, there are other rainbows to be seen around town”, chuckled the Panda, as he, Kiku and Miko-chan walked down to Asakusa Pier to get on the water bus service (水上バス, Suijō Basu). 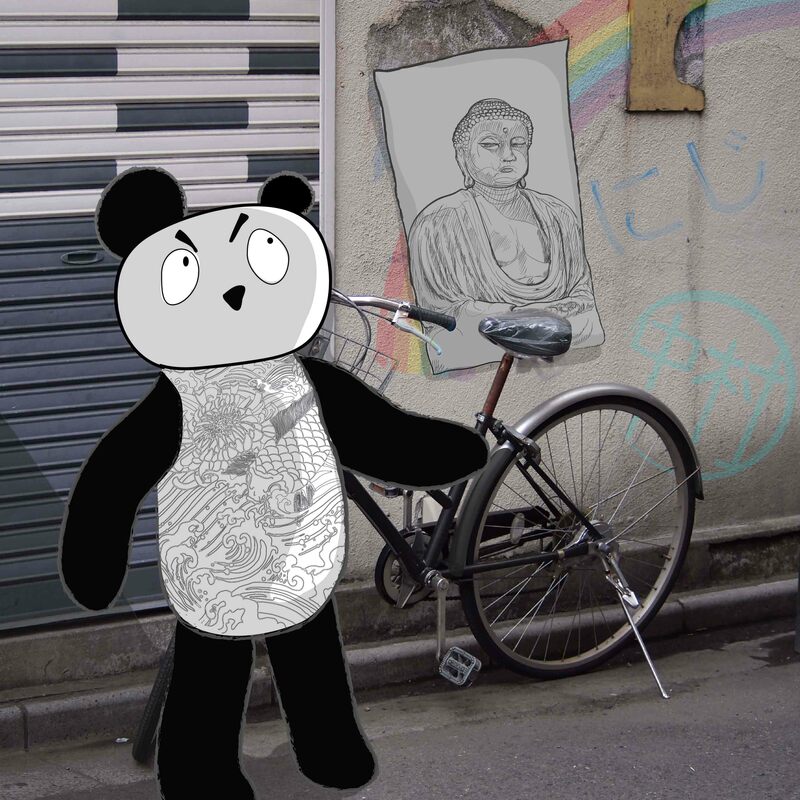 As they traveled down the Sumida river, Boss Panda told them of part of the creation myth of Japan. “The two creator deities, called Izanagi and Izanami descended to earth on a rainbow bridge and stirred the oceans, with the droplets from Izanagi’s spear creating islands, thus beginning the creation of Japan. Kiku pondered for a moment. “Some Japanese bridges remind me of rainbows too, with their arc shape”. Boss Panda nodded. Most of the water buses are operated by the Tokyo Cruise Ship Company. The Asakusa-Odaiba Direct Line (50 minutes, 1560 yen, 2-4 boats per day) is one of the most popular routes because of its boldly designed Himiko boats with panoramic windows. The boats do not run on the second Tuesday and Wednesday of each month (except for August). The Sumida River Line runs from Asakusa to Hama Rikyu garden (35 minutes, 980 yen, 1-2 boats per hour). The dock at Hama Rikyu is located within the garden’s paid grounds, and admission to the garden is included in the price of the boat ticket. After Hamariku, the boats then travel a further five minutes to the Hinode Pier (40 minutes, 780 yen from Asakusa), where a transfer can be made to boats bound for Odaiba. Note that Hama Rikyu is not served by boats in direction of Asakusa. The Odaiba Line travels from Hinode to Odaiba Seaside Park (20 minutes, 480 yen, about two boats per hour). The Tokyo Big Sight-Palette Town Line travels to both the Tokyo Big Sight and Palette town attractions (about 25 minutes, 410 yen, 5 boats per day), but it does not operate on Mondays and Tuesdays (except in the case of national holidays). Other cruise lines are also available from other companies, as well as cruises that include dinner or lunch. I would love to ride on a water bus! So nice to see my story friends again, Joanna. Thank you!